While I am doing my marketing the other days, I saw some nice sea prawns being sold at a very reasonable price of about SGD20 per kilograms. 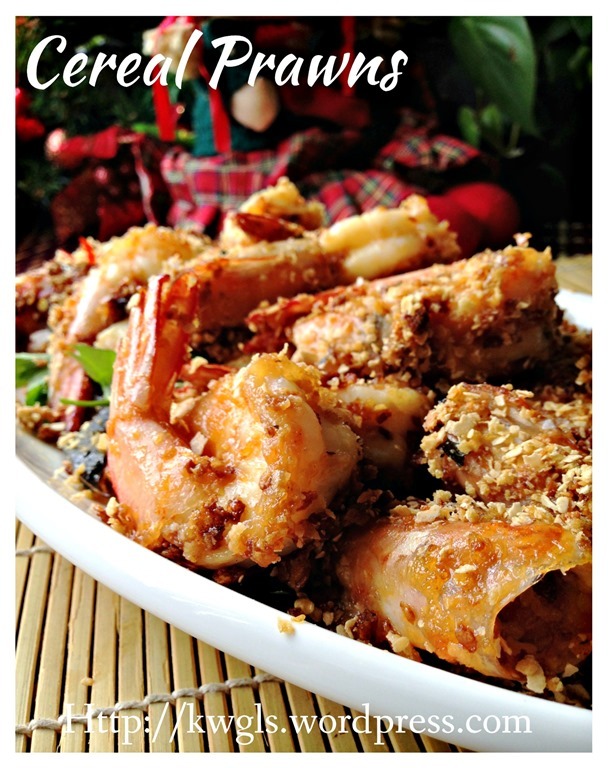 i bought some and decided to prepare some cereal prawns for my house guests. 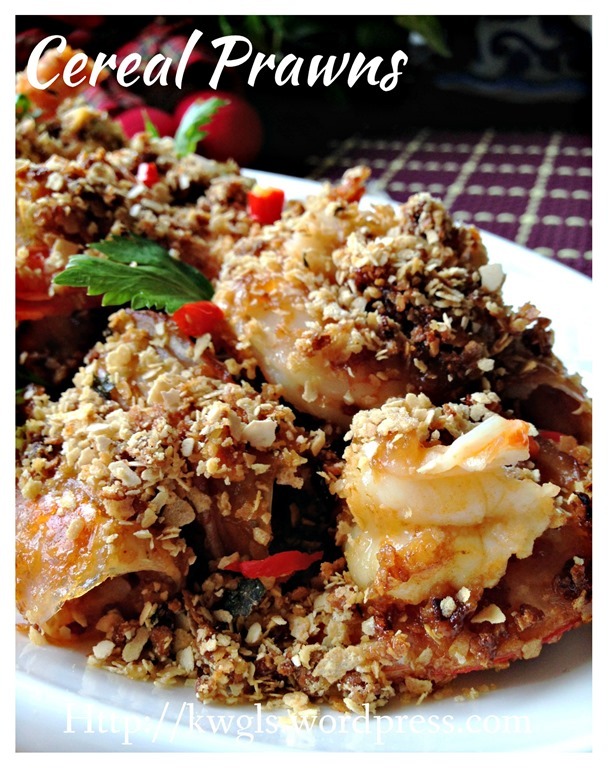 It is rather funny that there is a combination of cereal and prawns but it is a very common restaurant dish and coffee shop Zhi Char stores.. Due to the price of the prawns, the small plate of these prawns dish can be sold at quite a high price. 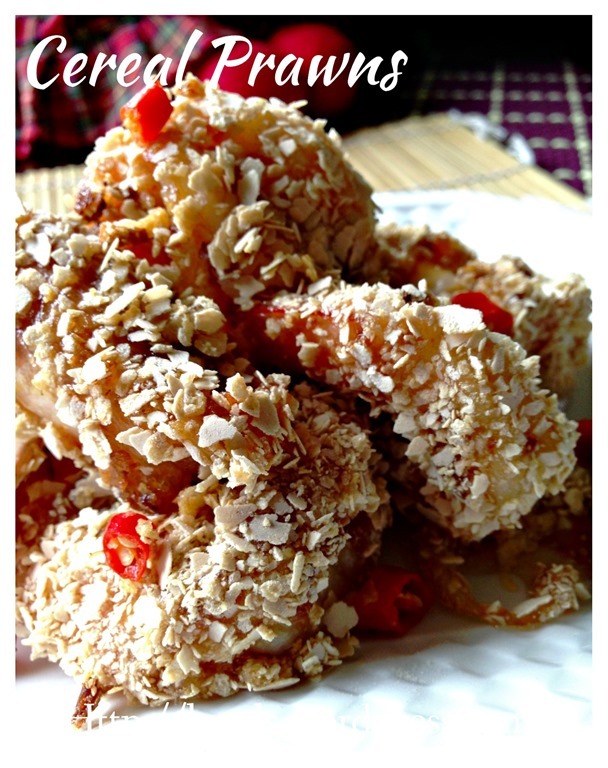 In fact, I especially like the sweet crispy and aromatic cereals. 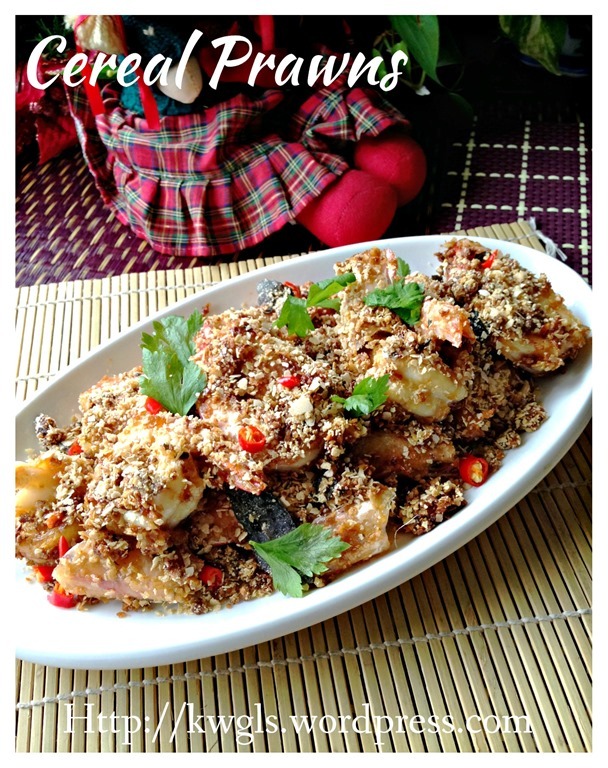 Surprisingly, it blends rather well with curry leaves and chilli padi which were stir fried together. 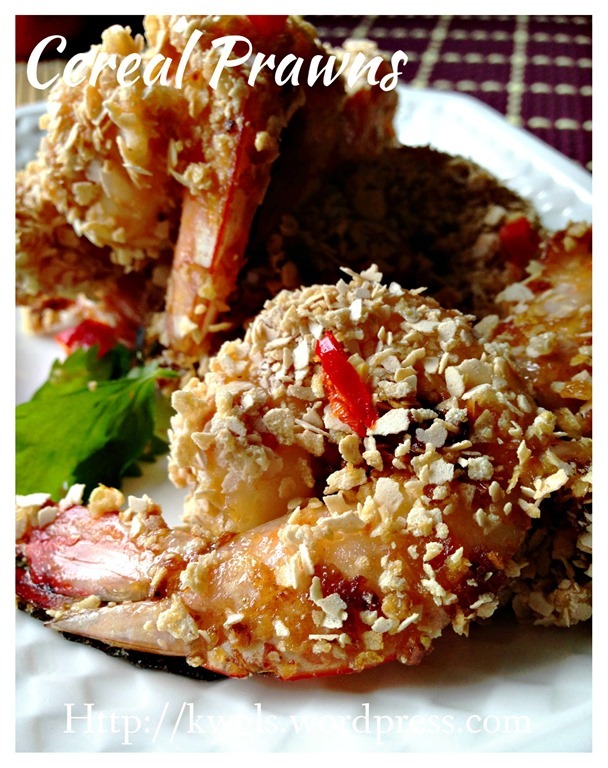 The prawns were oil branched for a few minutes to preserve its flavour and texture.. 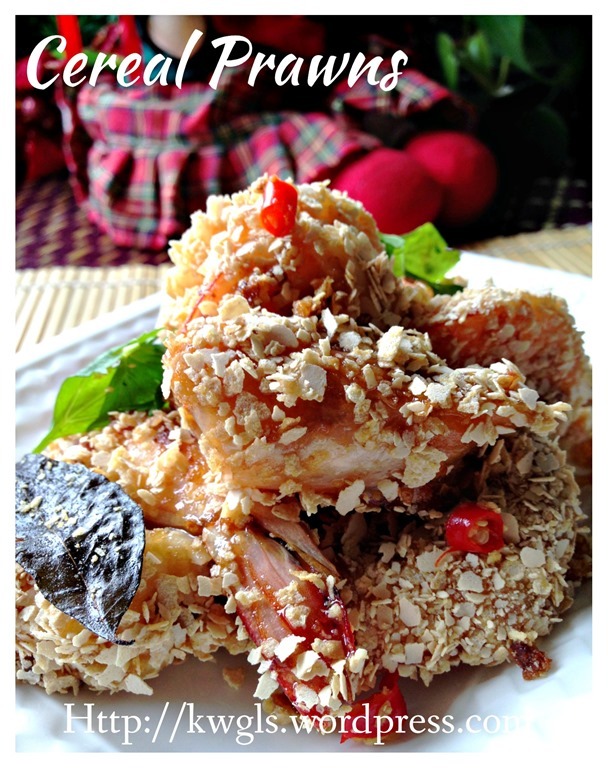 It was coated with some caramelized cereals and these provide additional sweetness to the prawn dish. 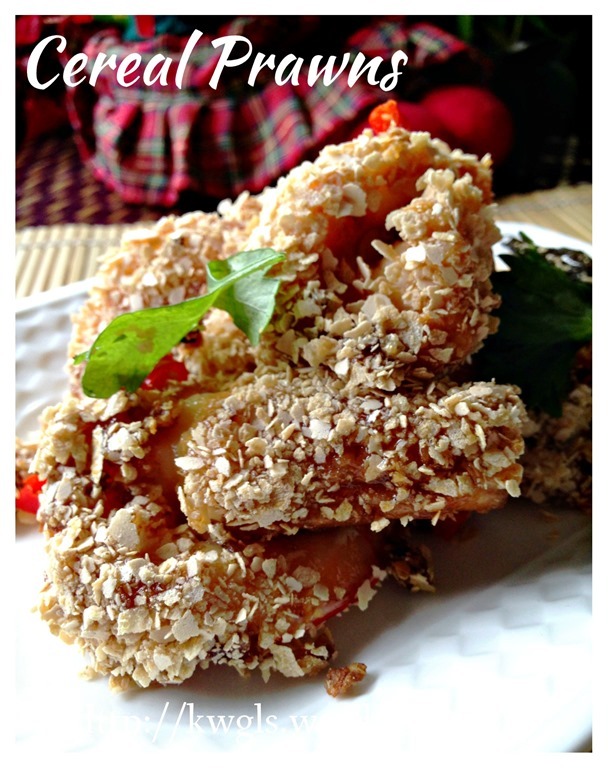 You have a choice to caramelize using white or brown sugar. In this illustration, as brown sugar was being used, therefore, the colour is a bit darker. 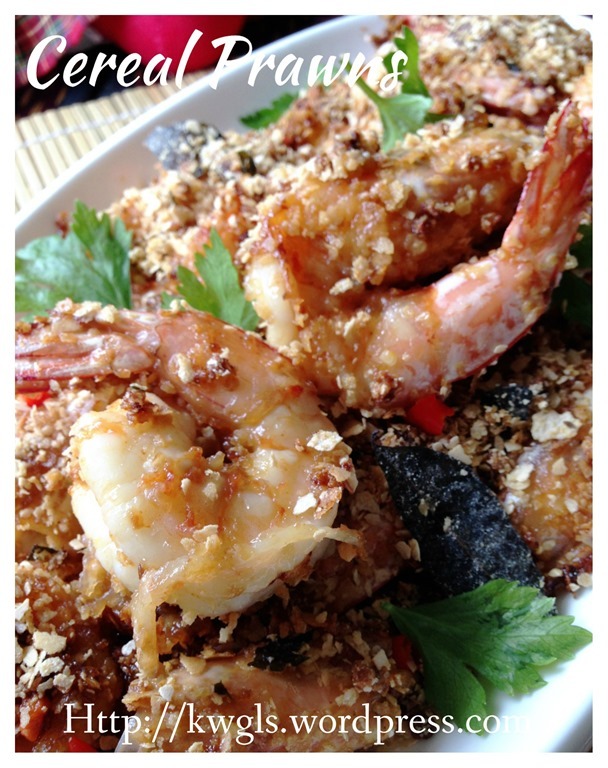 For the prawns, you can either shelled the prawns or keep the prawn shells intact. For this illustration, I have shelled the middle part of the prawns and keep the head and tail intact. 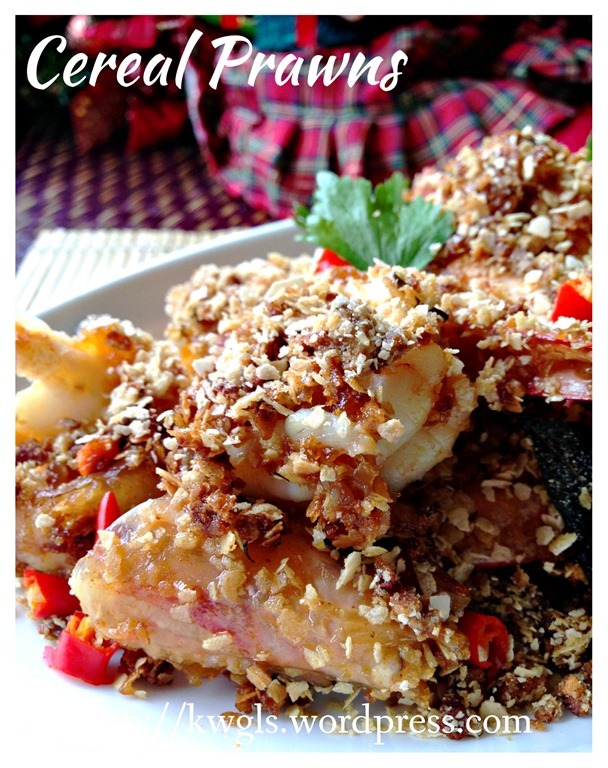 Marinate the prawns with the light soya sauce and corn flour for at least half an hour. Other ingredients that you can consider adding to the marinating are white pepper and some Chinese cooking wine or ginger juices. 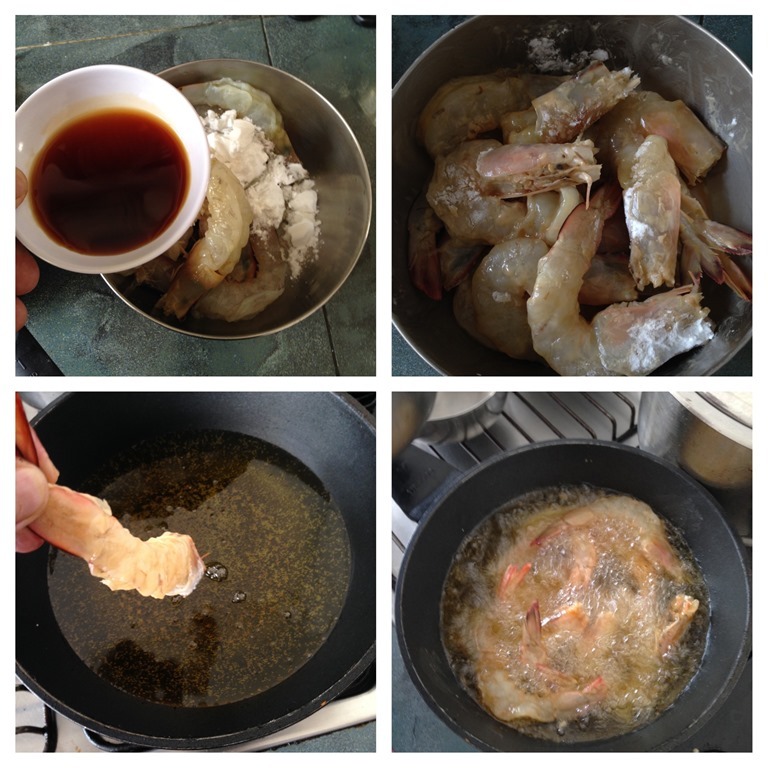 In a pot of hot oil, blanched the prawns for 2-3 minutes or until the prawn body starts to curl up. Drained and set aside for later stir frying. In a stir frying pan, add 1-2 tablespoons of butter or cooking oil (can use the cooking oil for deep frying earlier), sauté the chopped garlic until fragrant.and slight brownish. Add the brown sugar, stir fry until sugar starts to melt. Add in the baby cereal, milk powder quickly stir until the cereals are well mixed with the sugar. Change to heat to low and use low heat to continue stir frying until the cereal are crispy. 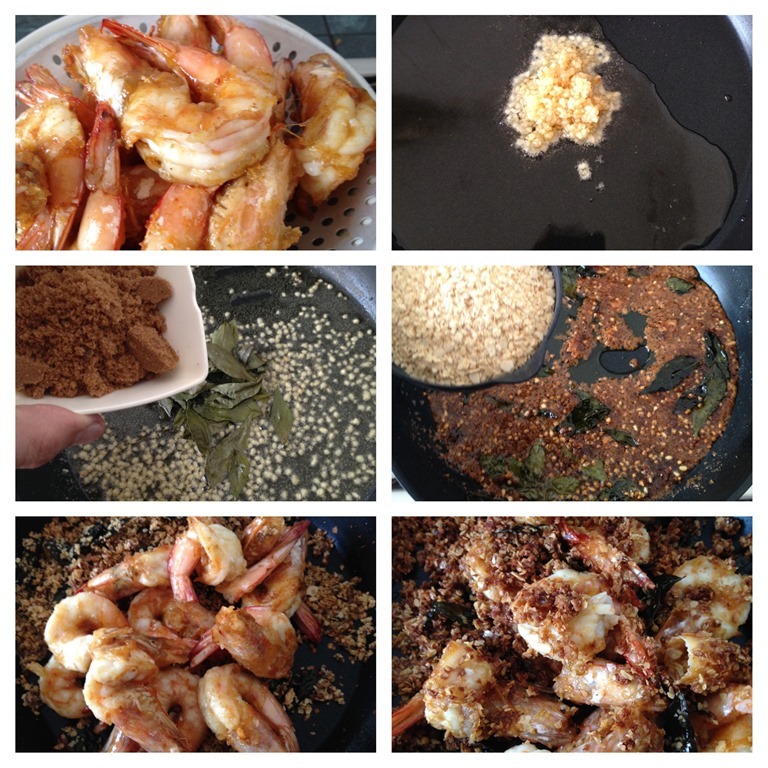 Add the prawns, stir fry for 1-2 minutes until well combined. Dish up and garnish with chopped coriander and chopped bird eye chilli, if preferred. 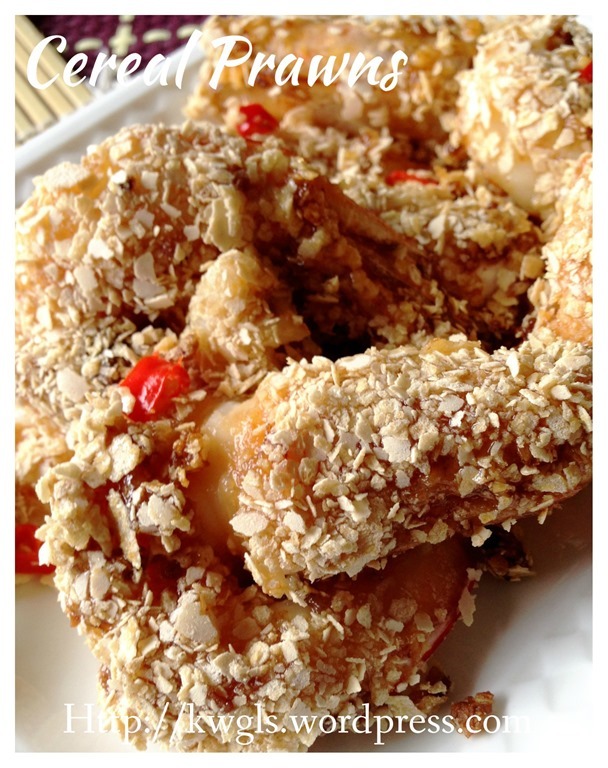 Best served hot as a standard side dish in a typical Chinese meal. 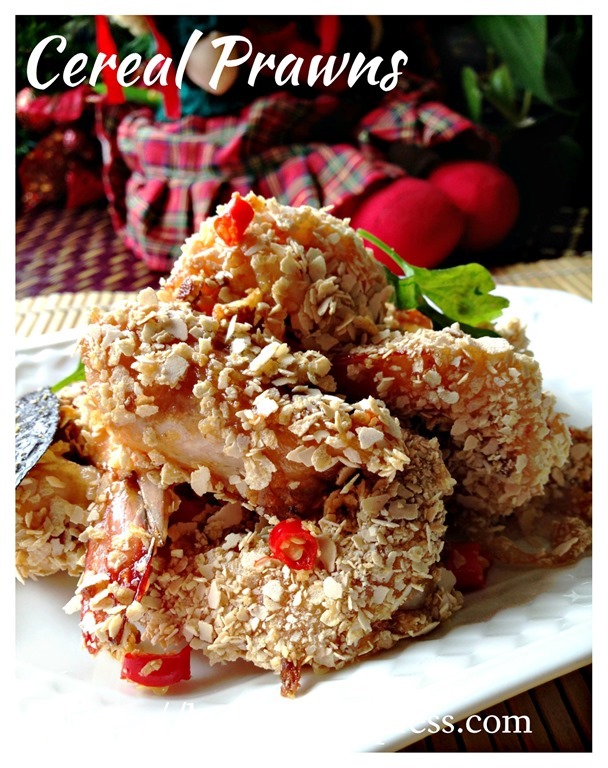 Not a difficult dish to prepare with great flexibilities. Please be advise that as this is a savoury dish, feel free to add or reduce the ingredients mentioned above to suit your family’s taste buds. If you like the baby cereal, you are welcome to more cereal to the dish. 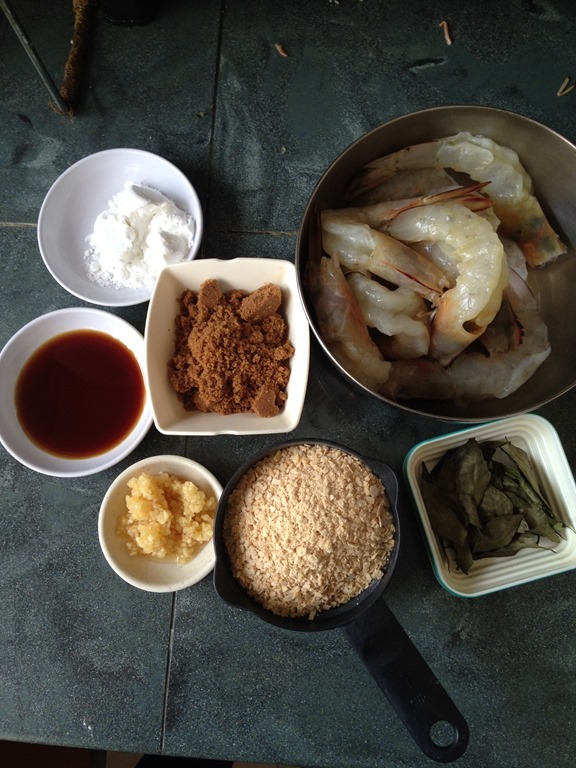 This entry was posted in Food Preparation Series, Seafood Dishes and tagged 8, cereal prawns, 麦片虾, GUAI SHU SHU, Guaishushu, kenneth goh, postaday. Bookmark the permalink.